Remove any fat or silver skin from deer roast(s) and slice it into 1/4″ strips, cutting along the grain of the meat. Mix all the ingredients thoroughly until all salts and sugars are dissolved in the water. Place in an airtight container with sliced meat. Let it marinate in the fridge for up to 3 days, stirring the mixture occasionally. After 3 days, remove the meat from the brine and allow the liquids to drip off. Spread out meat evenly on wire racks in a smoker (using hickory wood chips) and cold smoke for 2 hours. Turn off smoke and bring heat up to 160F to 170F for approximately 6 to 8 hours or until meat is fully dried. 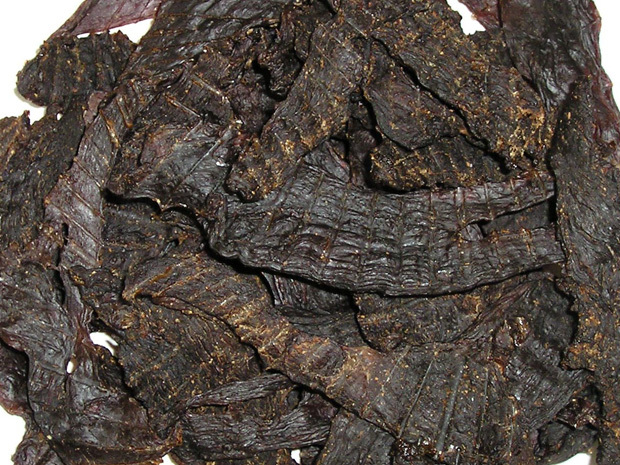 Other options are to finish the meat off in a dehydrator immediately after smoking. An oven may also be used as a dehydrator. Simply turn it on to its lowest possible setting and lay the sliced meat evenly spaced out across racks with a drip tray underneath. Prop a wooden spoon in the oven door so that it remains slightly open to allow moisture to escape so the jerky can properly dry. If you do not have access to a smoker, simply add 1 tbsp of liquid smoke to the brine then dry it out after 3 days in a dehydrator or oven. Do not over cook it or it will become dry and crumbly. The meat should bend fairly easy and slightly rip apart when it is complete.